College softball season has begun and I, personally, could not be more excited. I am a “retired” softball player due to some tough health diagnoses in high school but my love and appreciation for the game has yet to die nor will it! Our Oregon Ducks’ softball program is a force to be reckoned with, especially in the Pac-12. In fact, they have been predicted to win the Pac-12 Championship for the third season in a row. 1. Ranking: The Ducks are ranked No. 2, their highest preseason ranking ever, in the two major polls run by the National Fastpitch Coaches Association and USA Softball. 2. The Coach: These talented young women are led by Head Coach Mike White who has been coaching for Oregon’s program for the past six years. In his time as head coach he holds a record of 279-86-1. White has been incredibly successful with his program in these six years by leading the Ducks to a school record of 56-wins in 2014, the program’s first ever No. 1 ranking and a sweep of both the NCAA tournaments (regional and super regional) rounds at Howe Field. The Ducks have advanced to the super regional rounds for five consecutive seasons. White is assisted by James Kolaitis who is with the Ducks for his second season now and Chelsea Spencer in her third season as a coach for the Ducks. 3. Home Opener: The Ducks will get the season started at Howe Field for the first time in 2015 on March 13 in a three-game series against the university’s rival, Oregon State. 4. Recapping the 2014 season: “Oregon secured not only its first No. 1 ranking, but also its first No. 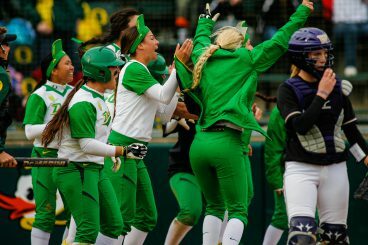 1 overall seed in the NCAA Tournament en route to a second Women’s College World Series berth in three seasons.” The Ducks finished their season with a 56 win, 9 loss and 1 tie season winning the Pac-12 Championship for the second season in a row. Ducks celebrating last year in game against the Washington Huskies. 5. Players to watch: “Catcher Janelle Lindvall, outfielder Janie Takeda and left-handed pitcher Cheridan Hawkins are among the 50 players named to the preseason’s player of the year watch list for USA Softball.” Lindvall hit 13 homeruns in the 2014 season and tied for the team lead. Takeda set a school record with eight triples and is the second two time All-American in program history. Lastly, lefty pitcher Hawkins, a.k.a. Pac-12 pitcher of the year, is an All-American player who set a university record of 330 strikeouts which ranked fourth in the NCAA. 6. Stats to know: The Ducks play offensively with a saying: “reload, not rebuild” which has helped them nail down their stats with 58.9 percent of Oregon’s hits, 62.9 percent of its runs, 57.1 percent of its home runs and 71.3 percent of its stolen bases as they return from last season. They are expected to have fairly similar statistics in their 2015 season as well. The Ducks are expected to have a great season for the third year in a row and with the assets they possess, there’s no reason that can’t be true. Head out to the final home opener Howe Field will ever host on March 13 for a three-game series against the Oregon State Beavers and watch your Ducks dominate! To find out more information about the Ducks’ upcoming season visit the previously mentioned article on OregonLive.